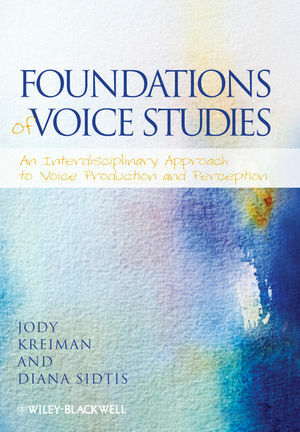 Foundations of Voice Studies provides a comprehensive description and analysis of the multifaceted role that voice quality plays in human existence. Jody Kreiman is Professor of Head and Neck Surgery at the University of California, Los Angeles. She is a Fellow of the Acoustical Society of America and has published over 60 scholarly papers in a variety of journals. Diana Sidtis (formerly Van Lancker) is Professor of Communicative Sciences and Disorders at New York University and performs research at the Nathan Kline Institute for Psychiatric Research. An experienced clinician, her research has yielded over 90 articles in scholarly journals and edited books. 2 Producing a Voice and Controlling Its Sound. 3 Neurological Foundations of Voice Production and Perception. 4 Physical Characteristics and the Voice: Can We Hear What a Speaker Looks Like? 5 Recognizing Speaker Identity From Voice: Theoretical and Ethological Perspectives and a Psychological Model. 6 The Brain Behind the Voice: Cerebral Models of Voice Production and Perception. 7 Identifying Unfamiliar Voices in Forensic Contexts. 8 Linguistic Uses of Voice Quality: How Voice Signals Linguistic and Pragmatic Aspects of Communication. 9 Perception of Emotion and Personality from Voice. 10 Miscellany: Voice in Law Enforcement, Media and Singing.